We're coming up on JLPT season again. A few readers have mailed/messaged in about locating past problems, practice exams, or other sources of study. In the past couple years, there was a big scramble because the test design changed and there were no published examples of past or sample exams that test-takers could use for study. That's now no longer the case--there are official publications of past exams. The name of the publication is 日本語能力試験公式問題集, or "Compilation of Official JLPT Problems." 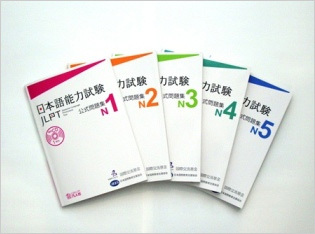 A single book is put out for each level, containing a single past JLPT exam and lagging at least a year after the test took place. You can pick them up in your local bookstore, or you can have them sent directly to your home by online retailers like Amazon.co.jp. The stuff contained in these books is exactly how the real test appears to real examinees. If you stick to the written time limits and use the CD contained within, you can recreate a testing experience quite close to the actual exam. When I studied for the 1級 test in the past, I followed a similar process with officially published past problems available at the time and was able to predict my score on the real exam within just a few percentage points. As a bonus, if you buy these books through Amazon, you have an opportunity to support AccessJ. Now, I know students are cheap. I used to be one not so long ago. I couldn't afford to buy books for all of my JLPT studying needs, and I dutifully scoured the Internet at the time for as much free study material as I could. Over the next couple weeks, I hope to help you do the same and locate some free sources of study material for the redesigned JLPT online. I will say, however, that the few books I did invest in when I was studying were very much worth the expense, especially the past exams. At 735 yen a pop, with a high quality recording of the listening exam on CD, these are really worth your attention. Another note: It used to be that you picked up entire scanned copies of past exams online from shady Chinese websites. The newer exam still doesn't seem to have been around long enough for that to be widespread--and the test hasn't been administered enough times for there to be an exhaustive supply of official questions anyway. So now a lot of the stuff floating around online (and in bookstores) are 予想問題, or questions that various companies and individuals in the know have predicted might be similar to what could actually be on an exam. These are still invaluable for practice, but you should familiarize yourself with the difference in terms.